Wanting my kids to love reading, I thought I’d make a cozy spot for them. We had a hall closet we were not using. It sits above the stairs and already had a seat built in to it. Perfect! The seat and floor of the closet was covered with bead board and painted semi-gloss white. It gets dirty, for sure, but it’s super easy to clean. There were actually two shelves but I removed one. I’m thinking about adding it back in since they have many more books they’d like to keep in here. Artwork might happen too? Things are always evolving around here. I added a command hook to one side for them to move the lantern if they want or to hang headphones on. 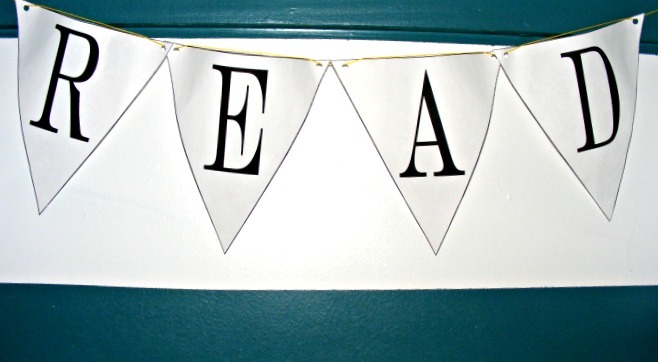 The “READ” banner was a fun last minute addition.I printed it from HERE. There are some days when I’d like to crawl in here with my Kindle and stay for hours. Do you have a designated spot for reading? For the kids? Or for yourself? Have you painted stripes? 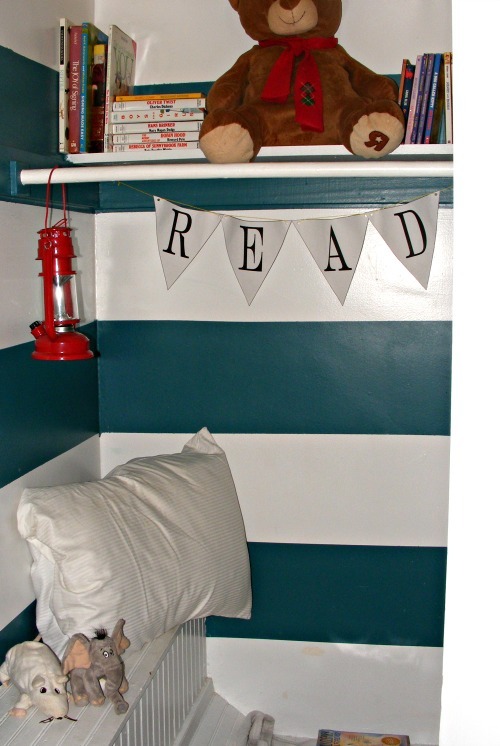 Cute Reading Nook! I wish I could have a reading nook 😉 I love the red lantern! Well Done! Found you at the Show-Licious link up, have a great weekend! I love the reading nook! My son likes curling up in his saucer chair, or hiding under a play fort we have in the house… I’d love to transform a closet into a reading nook someday, but it’d be way too tempting to just use it for myself! I haven’t ever painted stripes, but when I was younger, my mom and I used water guns to paint my bedroom– it was SO fun! That water gun paint idea is awesome! I can imagine my son would LOVE that. 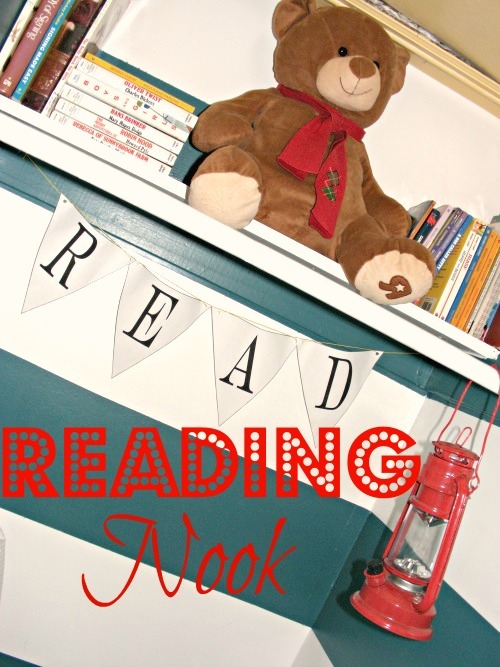 The reading Nook is so fun and definitely tempting some days!